Modified Orders for TS Overseas Scholarships Scheme/TS Overseas Vidya Nidhi Scheme/TS Overseas Study Scholarships Scheme to SC, ST, BC, Minorty Students, Telangana SC, ST, BC, Minority Students Overseas Scholarships/TS Foreign Study Scheme scholarships/ TS Foreign Education Scheme scholarships : Ambedkar Overseas Vidya Nidhi Scheme for SC & ST Students/ Overseas Study Scheme for MW Students /Mahatma Jyothiba Phule BC Overseas Vidya Nidhi Schemes for BC Students. TS Overseas Scholarships Scheme Revised guidelines. Changes in VidyaNidhi Conditions. Ambedkar Overseas Vidya Nidhi Scheme scholarships. SC, ST Overseas Vidya Nidhi Scheme scholarships. SC, ST Ambedkar Overseas Vidya Nidhi Scheme scholarships. SC, ST Ambedkar Overseas Study Scheme scholarships. SC, ST Ambedkar Foreign Study Scheme scholarships. Chief Minister's Overseas Scholarship Scheme for Minorities. CM's Overseas Scholarship Scheme for Minorities. MW Students Overseas Vidya Nidhi Scheme scholarships. 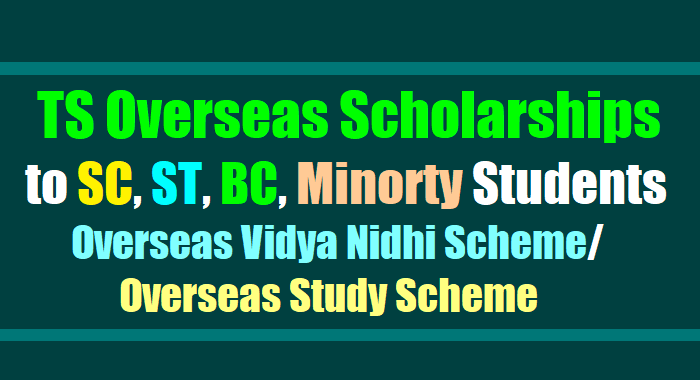 Minority Students Overseas Vidya Nidhi Scheme scholarships. Minority Students Overseas Study Scheme scholarships. Minority Students Ambedkar Foreign Study Scheme scholarships. Mahatma Jyothiba Phule BC Overseas Vidya Nidhi Scheme scholarships. MJP BC Overseas Vidya Nidhi Scheme scholarships. Mahatma Jyothiba Phule BC Overseas Study Scheme scholarships. Mahatma Jyothiba Phule BC Foreign Study Scheme scholarships. BC Students Overseas Vidya Nidhi Scheme scholarships. G.O.Ms.No.22 Dated: 22-11-2017: GOVERNMENT OF TELANGANA - BACKWARD CLASSES WELFARE (B) DEPARTMENT BCWD - Certain modifications in the existing financial assistance scheme of “Mahatma Jyothiba Phule BC Overseas Vidya Nidhi” for BC / EBC Students pursuing higher studies in foreign countries - Orders - Issued. 1) G.O.Ms.No.23, BC Welfare (B) Department, dt:10.10.2016. 2) G.O.Ms.No.66, Scheduled Caste Development (EDN), Department dt:09.11.2017. 3) From the Special Secretary to Hon’ble CM, CMO.No.47/SSCM (BR)/2017,dt:20.11.2017. ORDER: In the reference 1st read above, the Government have introduced “Mahatma Jyothiba Phule BC Overseas Vidya Nidhi” Scheme to BC students for pursuing higher studies at foreign universities. 2. In the reference 2nd read above, the Scheduled Caste Development (EDN) Department have issued partial modifications to the existing financial assistance Scheme to pursue higher studies at foreign countries, uniformly to all the welfare Departments. a. The maximum age under the scheme shall not exceed 35 years as on 1st July of the year of advertisement, as per SC/ST overseas scheme. b. The students who have not applied for 1st installment/1st year shall be eligible for 2nd installment/2nd year under the Scheme. c. The student shall be eligible for an educational loan from any nationalized bank or any other bank, the Department may issue a letter “to whom so ever concerned” informing the selection of candidates along with financial assistance details so that it will be helpful for the students to obtain Bank loan for any additional amount required. d. 5% of 300 students i.e., 15 seats shall be reserved/considered for Economically Backward Classes students. e. Family Income shall be less than Rs.5.00 Lakhs per annum from all sources. This enhanced income limit will apply only for Overseas Scholarship scheme. g. Ph.D Courses are also eligible under the scheme. i. Relaxations of 60% minimum marks in degree/PG is considering only, subject to the candidate gets adequate score in eligibility test such as GRE/GMAT/ IELSTS/TOEFL/PTE and gets unconditional admission in the abroad Universities/Institutions in case if the registrations are not up to the expected levels within the Budget allocated and being done only on case to case basis by the Government. j. One way economy class Air ticket fare will be paid for a maximum of Rs. 50,000/- (Rupees Fifty thousand only) or actual charges whichever is less for any country. Actual Visa Charges are also paid separately in addition to the Scheme amount of Rs.20.00 lakhs. 4. The DDO, O/o the Commissioner, B.C. Welfare, Hyderabad shall be the competent authority for drawal and disbursement of Overseas Scholarship to the eligible students of all the district in the State. 5. The above modifications along with the existing guide lines issued in references 1st and 2nd read shall be considered for selection of the students under the scheme. 6. The Commissioner, BC Welfare, Telangana Hyderabad shall take necessary further action accordingly. G.O.Ms.No.66. Dated:09.11.2017 - GOVERNMENT OF TELANGANA - SCHEDULED CASTE DEVELOPMENT (EDN) DEPARTMENT- SCDD- Education - Certain modifications in the existing financial Assistance Schemes such as “Ambedkar Overseas Vidya Nidhi Scheme for SC & ST Students/ Overseas Study Scheme for MW Students /Mahatma Jyothiba Phule BC Overseas Vidya Nidhi Schemes for BC Students” for pursuing higher studies in foreign countries - Modified Orders - Issued. 5. Mandatory Requirements (i) He/She should have a valid TOEFL/IELTS and GRE/GMAT with the following minimum scores. 6 Mandatory Requirements The Candidate shall not change the University/Course/research topic for which the scholarship has been sanctioned.